India has shot down a satellite in space with an anti-satellite missile. PrimeMinister Narendra Modi hailed the test as a major breakthrough for New Delhi's space programme. However, opposition leader, Mamata Banerjee, is to lodge a complaint against Modi's announcement claiming he had done it to "reap political benefits" ahead ofgeneral elections due to take place next month. 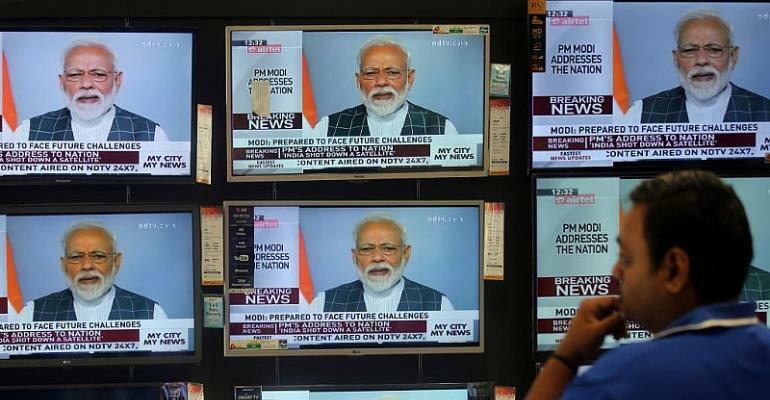 Modi made the announcement in a television address to the nation pointing out that India is only the fourth country to have sed such an anti-satellite weapon after the United States, Russia and China. However, such capabilities have raised fears of the weaponisation of space and setting off a race between rival powers. "Some time ago, our scientists, shot down a live satellite 300 kilometres away in space, in low-earth orbit," Modi said, calling it a "historic feat", adding that India has now "registered its name as a space power." Following today's announcement, Mamata Banerjee, leader of the All India Trinamol Congress said she was lodging a complaint against the Prime Minister's address, claiming he had done it to "reap political benefits" before April's elections. In a tweet this Wednesday,Banerjee, who is the chief minister of West Bengal state and a potential prime ministerial candidate said: "Today's announcement is yet another limitless drama and publicity mongering by Modi desperately trying to reap political benefits at the time of election." She also claimed the move is a gross violation of an electoral code of conduct and will lodge a complaint with India's Election Commission. There has been no comment as yet from neighbouring Pakistan nor reaction from China's foreign or defence ministries. Modi who is heading a Hindu nationalist-led government has taken a consistently strong position on national security, launching air strikes last month on a suspected militant camp in Pakistan that led to retaliatory raids by Pakistan in a dramatic ratcheting up of tensions between the nuclear-rivals.